Explore the author’s genre-crossing work below. 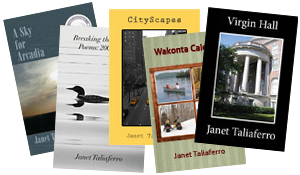 Janet’s books all reveal challenges facing the characters along with the universal themes inherent in human struggle, passion, triumph, and loss. Sheila O’Connor, Brooklyn born and convent educated, leaves the east coast for her freshman year at college at Southern Methodist University. Her three suite mates are familiar with what is an alien world to her. But Sheila has her own secrets which will affect all of them before the year is out and continue to echo even when the women meet for a thirtieth reunion. Set in the early eighties, this is the story of Mary Ann, who awakens from the nightmare of an attempted suicide to what she considers the nightmare of daily life and recovery from addiction. This book of short stories begins in June, where Ellen Stanley is spending time at the lake with her daughter, trying to come to terms with tragedy. The book continues, recounting incidents in the lives of working people, professionals, and outcasts in a small Wisconsin town. The final story is set in May, and provides a resolution to Ellen’s initial story. A collection of thirteen short stories, each set in a different sort of urban landscape. The stories in the book deal with everything from everyday challenges to life-changing situations. Most of the stories have a twist in the plot. A chapbook of poems written about the lake house in Northern Wisconsin where the poet spent summers in her youth and that she still shares with her family. They are poems of memory and place as well as encompassing the arc of a life lived.